Erected in Whitehall as a monument to honour the war dead, the Cenotaph was instantly recognised as a powerful symbol of sacrifice and tribute. Although it was later to become the focal point of annual Armistice Day commemorations, its first ceremonial use was as part of the Victory Day celebrations on the 19th July. 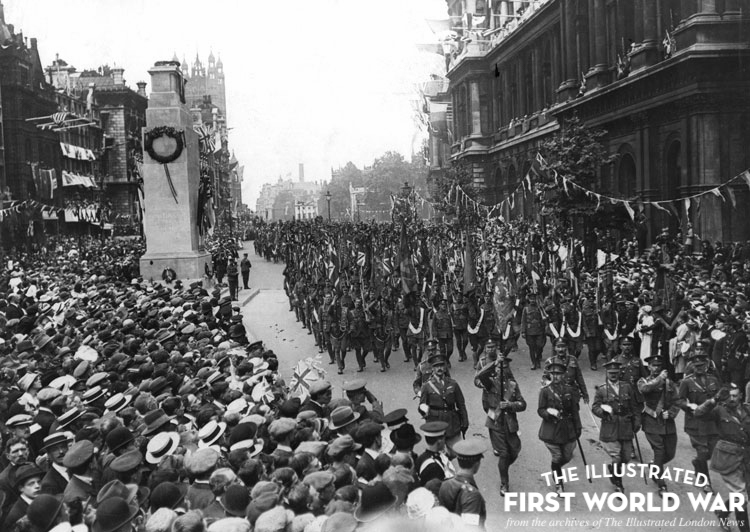 The Illustrated London News dedicated a special issue to these celebrations, showing troops marching past the cenotaph, and General Douglas Haig saluting as he rode by on horseback. Coverage picked up on the personal aspects of this commemoration. The Illustrated London News reported how, on the morning of Victory Day, a group of bereaved relatives visited the cenotaph to lay wreaths at its base: “so their wreaths remained there while the great pageant passed by, silent witnesses to the private grief that underlies all public rejoicings over Victory.” The Cenotaph was a symbol of public tribute, but also provided a focus for more personal forms of grief. The cenotaph also provided powerful symbolic imagery for artists who wished to depict a nation in the aftermath of the war. One illustration in the ILN, for instance, shows the cenotaph as a scene “where all classes mingled in a common tribute to their fallen heroes.” Another, in The Bystander, gravely considers the enduring legacy of the war, depicting a soldier’s ghost guarding the cenotaph by night. The original Cenotaph was a temporary construction of wood and plaster designed by the architect Edwin Lutyens. Its popularity was such that a permanent version of the monument was installed the following year. This new stone cenotaph was unveiled on Armistice Day, the 11th November 1920, the same day as the burial of the Unknown Warrior at Westminster Abbey.